When you work with several files and folders there’s a big possibility of getting broken links in your start menu. This usually happens if the concerned file or folder is deleted or moved to a different location. In addition to this broken links may also appear when programs are uninstalled. 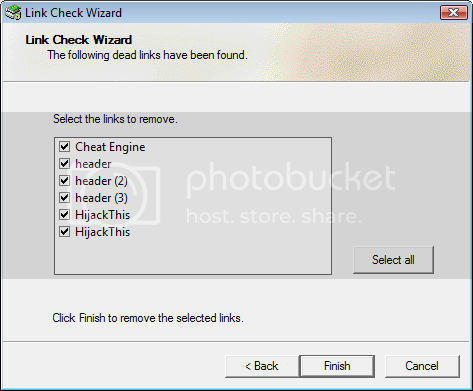 Link Check Wizard is a small tool that scours all drives for broken links. When it finds a dead LNK file the Wizard gives you the option to delete the broken shortcut. You can select the ones you want to delete or simply select all the broken shortcuts in the overview. A click on the finish button will delete all selected links from the Windows Start Menu. The software program will only delete the shortcuts and not the folders that they reside in. This utility works perfectly on Windows 2003 and XP. Nothing is mentioned about Vista, but I tried it on Vista and it worked perfectly. I guess it should work fine on Windows 7 too.